Fusion Fitness busts a move! Helping people Find Their Strong, Inside and Out, Fusion Fitness hired Sauce to make their web presence and marketing efforts equally strong! Fusion Fitness Memphis is a trusted name in the Mid-South for delivering life-changing health and fitness results, but their in-studio client experience wasn’t being communicated successfully outside the studio, either online or off. In order to eliminate this disconnect, Sauce developed a new brand strategy, slight repositioning, and many new assets, including photography, videography, graphic designs, and a workhorse of a website. And that was just phase one! 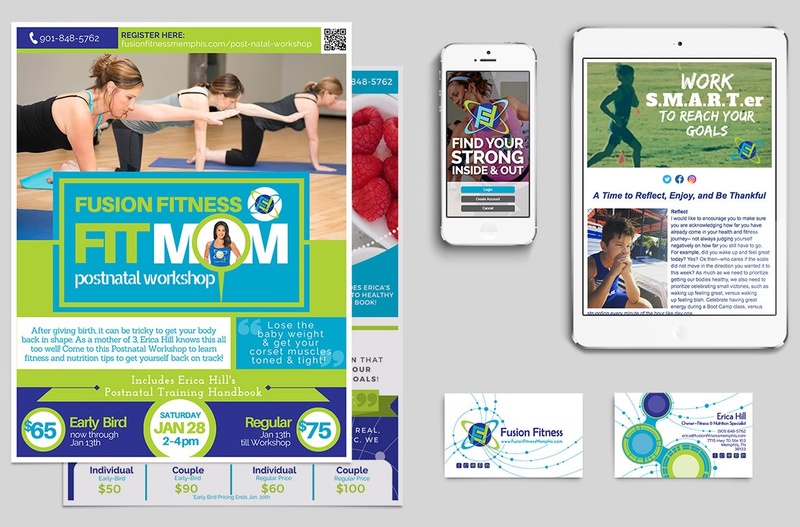 We managed their digital presence and social media channels for their first year post site launch, and our ongoing relationship with Fusion consists of dynamic custom marketing campaigns–a weekly blog, newsletter, and nutrition program. We designed and developed their new website; designed a new mobile app; set up inbound marketing and social media management tools; took photos including headshots, team photos and promotional photos; designed flyers, business cards, one-sheets, a tri-fold brochure, t-shirt designs, canvas wraps, gift cards, gift certificates, print ads and digital promo images. In tandem with designing and developing all of the above, we also managed Fusion’s social feeds from August 2016 through June 2017. We developed an ongoing editorial calendar and provide consistency in the delivery of valuable, relevant content to their online audience via weekly blogs and newsletters.